For a while now I’ve been looking for some driving goggles. 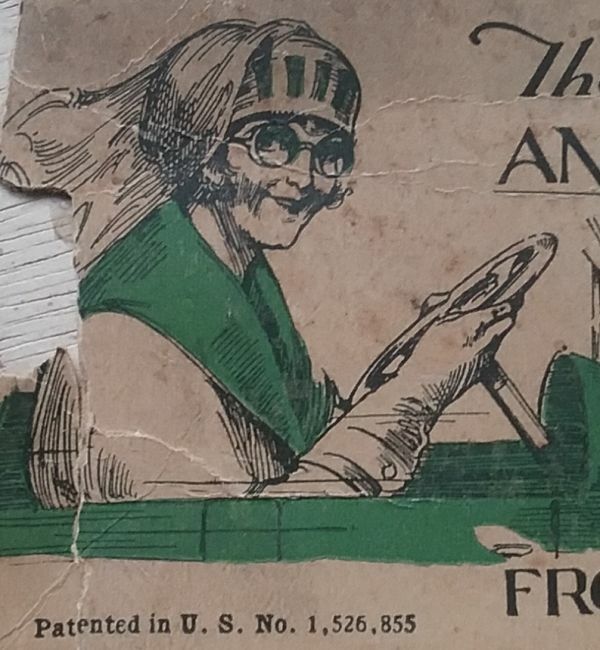 The problem with finding a pair is that I had to first educate myself on what was actually being made and worn for driving in the early days of the automobile. I’ve been collecting photos and catalog pages, but the minute I went to etsy to look at what was available, I became confused. First of all, not all sunglasses are goggles, and not all goggles are sunglasses. Second, is Steampunk still a thing? Almost every pair of goggles I found were tagged steampunk. And not all older goggles were meant for motoring. 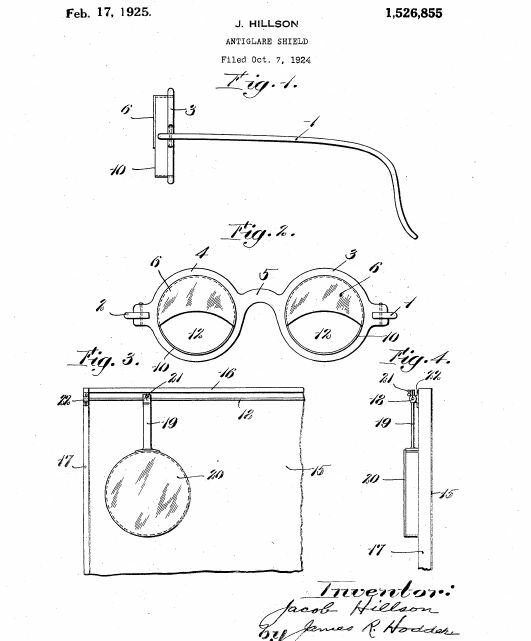 Many were intended for workers who needed eye protection, such as welders. So what’s a goggle-desiring girl to do? I’ve learned to look at only the listings that have the original box. The great majority of the ones I found were made by the Willson Products Company of Reading, PA. They made eyeglasses, and then branched off into industrial eyewear. A lot can be learned by looking at the information on the boxes. I’ve determined that the great majority of goggles offered for sale on etsy are welding goggles. But somewhere in my searching, I came across The Fairmont Anti-glare Shield. 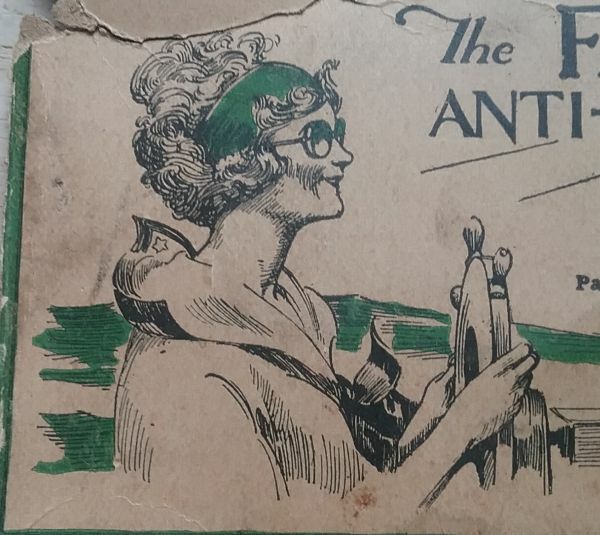 Due to the presence of the fantastic box, there could be no question but that these are women’s 1920s driving and sun glasses. I hope you can tell that the tinted plastic covers only about half of the surface inside the rims. The rest is open. The rims are almost half an inch tick, and are transparent as well. 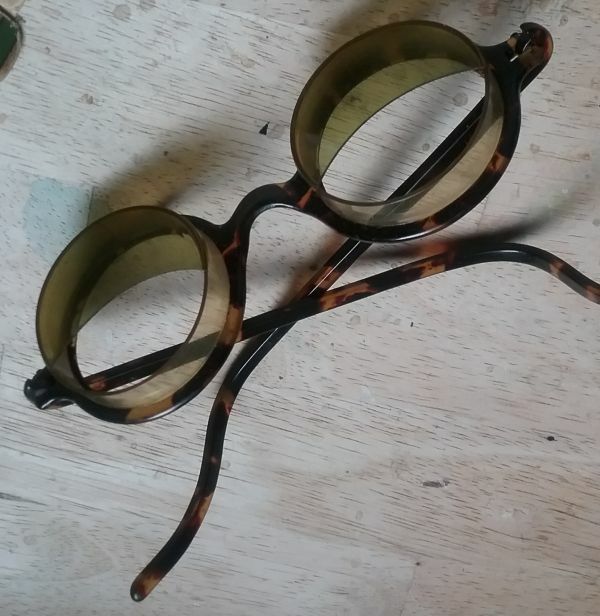 I tried these on, and was actually surprised at how well I could see through them. The transparent rims distort the vision somewhat, but without them the field of vision would have been too narrow. I was delighted to see this patent number. The US Patent Office database is completely online and searchable. And here is the drawing that was submitted with the original patent application. The inventor was Jacob Hillson of Newton, MA. 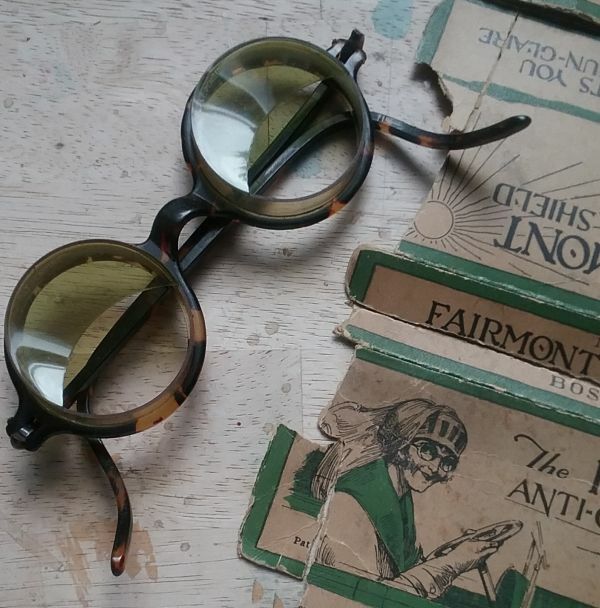 The patent was granted in February of 1925, and by November the Fairmont Optical Manufacturing Company of Boston was advertising the new product in newspapers and magazines nationwide. The ad above was in the November 1925 issue of Popular Mechanics magazine. You’ll be happy to know that these glasses also worked when boating. 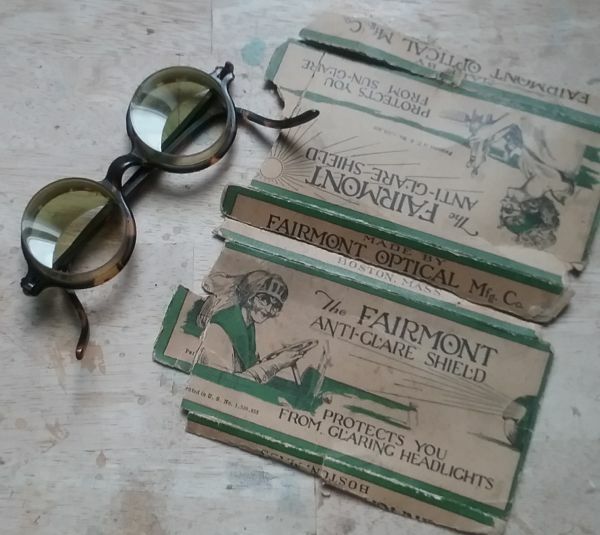 I’m really happy with these rare 1920s anti-glare shield glasses, but the search for goggles from the early days of motoring goes on. And for all you dog lovers, here are Bud’s goggles. Bud accompanied Nelson Jackson and Sewall Crocker as they drove across the country in 1903. These are in the National Museum of American History in Washington. Excellent article! Thanks as always! As soon as you said “I tried them on”, I was expecting to see an image of you modelling them for us. Please post an image! Hear, hear! We want a photo of you in the glasses. Fascinating to see the inventor’s patent info, along with your own experiences – thank you! We can always trust you to get to the bottom of things! These are absolutely amazing!! What a great find and wonderful research! So very interesting! Really enjoyed this post!